Brendan Coughlin, who runs the student loan refinancing unit for a major bank, is very upfront about this: some young adults should not refinance their loans. One example is a graduate new to the labor force who doesn’t feel stable yet in his or her job. Refinancing a federal student loan with a high interest rate can make sense and saves money. 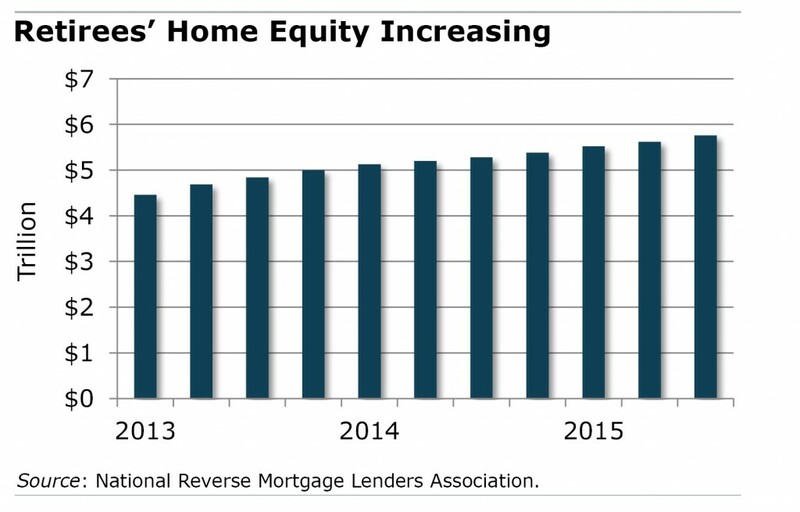 But one reason not to refinance federal loans is that they have a major advantage over loans refinanced by private lenders: flexible repayment options for those who might have difficulty meeting their monthly payments later. Another reason not to refinance is that the government forgives the debt after five or 10 years for certain types of teachers and public service workers. Understanding whether to refinance is so important that Coughlin, as president of Citizens Bank’s consumer lending unit, instructs the bank’s loan officers to talk prospective customers through the pros and cons three or four times – to make sure they’re clear about what’s at stake. “We really don’t want to have a customer swap out their loans and have a surprise. We want to make sure they’re making the right decision,” he said. A survey throws a new spotlight on the employer-employee disconnect over 401(k)s that has also been well-documented in research studies. The survey of 1,000 employees reveals that workers lack confidence in their ability to navigate basic aspects of their retirement plans, while the 200 employers also surveyed have a more optimistic view of how workers are doing. Consider the most basic question of how much to put away for retirement. 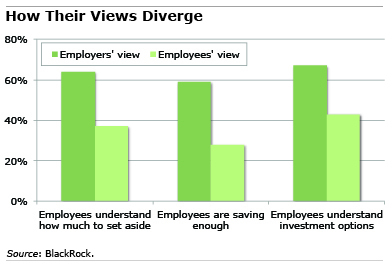 Two-thirds of employers believe their workers know how much to save, while only one-third of employees feel they know, according to BlackRock. And while nearly two-thirds of employers believe the majority of workers save enough, a minority of workers does. Most employers also believe their workers understand their investment options. Yet less than half of the workers say they do – and only 30 percent feel like they’ve made the right investment choices, according to the BlackRock survey. (Full disclosure: BlackRock is a corporate partner of the Center for Retirement Research at Boston College, which supports this blog). Privately financed college loans were less than 10 percent of the $1.3 trillion in unpaid student debt last year, according to the Consumer Financial Protection Bureau. The bulk of student loans are funded by the federal government. But the minority who borrow from private financial institutions often learn painful lessons after graduation: it is much more difficult to negotiate affordable repayment plans with private lenders. Private loans are unlike federal student loans, which have standardized repayment options and procedures. This blog is intended to help parents and future college students avoid getting into difficult situations in the first place with private loans. Squared Away interviewed two student loan experts at Clearpoint Credit Counseling, an Atlanta non-profit: Terrence Banks, a counselor who works directly with borrowers, and Thomas Bright, a blogger. Question: Graduates trying to renegotiate their private loans conveyed some harrowing stories in Clearpoint’s 2013 blog post. Have things improved since then? Terrence: The complaints are still valid and still rampant. But some – not all – private lenders have stepped up to the plate to make private loans a bit more financially feasible. Q. What would you advise parents and matriculating students do when making their first borrowing decisions? Terrence: Exhausting the federal loan option is paramount before you go to the private loans. If you find yourself in trouble where you can’t make a payment, you have more options under the federal than the private loans. Also try to find out the potential income for your future profession before going down this road and borrowing at all. And then look for grants – there’s a slew of grants that are untapped each year because people don’t take the time to access them because student loans are so readily available. This was going to be a quick blog post about the new student loan repayment program rolled out by the federal government in January. But the differences between it and the seven plans that preceded it were too confusing to figure out on a tight deadline. This isn’t just the view of one cranky blog writer. Craig Lemoine, a financial planning professor and student loan expert at the American College of Financial Services, which trains financial planners, also admits to being confused about the repayment options, which keep increasing in number. Could Social Security Statement Do More? So how about using the Social Security Statement that lands in their mailboxes, grabbing their attention, to spur them to action? The statement is already valued by millions of Americans. A survey funded by the U.S. Social Security Administration (SSA) found that people who received statements were “dramatically” more knowledgeable about their basic pension benefits than people who had already retired when SSA started mailing them out in the mid-1990s.